Excerpt from U.S. Coast Guard “Proceedings of the Marine Safety & Security Council” magazine by LCDR Tony Russell, former Commanding Officer, USCGC Nantucket. Life at sea can be hard for the commercial seafarer. Complicating the matter is the labyrinth that is the international maritime industry, in which it is not uncommon for a ship to have regulatory, business, and physical ties to a multitude of countries and jurisdictions simultaneously. On occasion, this formula develops into a complex and frustrating problem for the U.S. Coast Guard, one that we cannot ultimately solve ourselves through our safety and security missions—only through partnership with industry and other non-governmental agencies. Such was the case of the M/V Haitien Pride. It started when a Good Samaritan vessel received a mayday call from this foreign-flagged coastal freighter and its crew of seven, sailing from Haiti with the intent to enter Miami. This began an eight-day saga that required the efforts of multiple elements of Coast Guard Sector Miami, Immigration and Customs Enforcement (ICE), Customs and Border Protection (CBP), the Seamen’s Church Institute of New York and New Jersey (SCI), the ship’s representative, and the governments of the Bahamas and the Philippines to bring it to a successful conclusion. At 10:57 a.m., May 5, 2006, Sector Miami’s command center received a report that the M/V Haitien Pride was disabled and adrift approximately 27 miles southeast of Miami. The Coast Guard Cutter Cormorant, with a port state control inspector aboard, was dispatched to conduct a search and rescue boarding on the vessel. In the meantime, the master and crew began to make various claims regarding poor conditions, accompanied by requests to enter Miami. The vessel was found to be structurally sound and not in distress and the Cormorant provided food and water to sustain the crew. Sector Miami decided that the standard safety and security requirements for entry into the U.S. would not be waived and the vessel would have to submit the required advance notice of arrival, document of compliance, safety management certificate, and international ship security certificate. These entry requirements were provided to the vessel’s owner and agent, as well as an attaché from the Philippine Consulate who was sent to help resolve the situation. They made the decision that meeting the requirements was not financially feasible and began to make arrangements for the vessel to go to the Bahamas. The master and crew of the vessel were not pleased with this situation and continued to state their desire to take the vessel to Miami, where they hoped to deliver the ship to the owner in an attempt to get paid back wages and return to the Philippines. On the morning of May 12, Sector Miami received a call from the vessel’s agent stating that it was once again en route to Miami. The situation suddenly got more serious, and the focus shifted from safety to security. An aggressive effort was made to re-locate the vessel, which had turned off its required Automatic Identification System, making things more difficult. It was found drifting in the Gulf Stream, southeast of Miami. While the significant concern continued to be the safety of the crew, the Coast Guard and its DHS partners began developing a contingency plan in the event the vessel attempted an illegal entry. An interagency boarding team was quickly assembled from the patrol boat Nantucket, Sector Miami PSC inspectors, agents from ICE, and a non-governmental advocate for seafarers—Douglas Stevenson from the Seamen’s Church Institute. 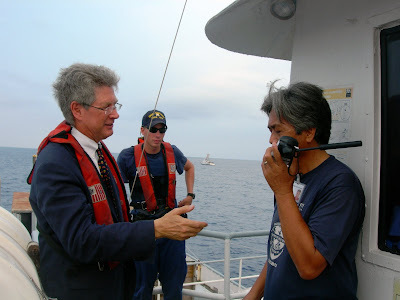 Once permitted aboard, the non-governmental seafarer advocate enacted the mission of the Seamen’s Church Institute—to provide support and advocacy to seafarers. In this case, he understood that the best thing the master could do for himself and his crew would be to go to the Bahamas, where no-cost arrangements could be made to repatriate them to the Philippines. Almost immediately after Stevenson stepped aboard, the tone and progress of the negotiations improved. This was likely due to SCI’s reputation, credibility, and the fact that someone other than a government agent was providing assurances of taking care of them. In less than two hours, the master and crew agreed to go to the Bahamas if clearance could be arranged and assurance made that they would not be arrested upon arrival. The vessel safely anchored near Freeport the morning of May 13, and the crew was eventually repatriated. Though unusual and challenging, this case had many positive benefits. It tested the improved relationships and coordination that have been established since the stand-up of the Department of Homeland Security. It demonstrated the value of the new Coast Guard sector’s unified command structure, combining response and prevention responsibilities under one commander. And it showed the value of looking beyond the obvious government agencies and involving third-party non-government organizations to help broker acceptable solutions in these very complex and sensitive situations that don’t fit neatly into DHS’s jurisdictional responsibilities. The most significant point made by this case, and others like it, is that the Coast Guard can find that important and delicate balance among safety, security, and compassion that makes it such a unique military, law enforcement, and humanitarian organization. “The Coast Guard’s best side really shined through and showed that it can provide compassionate assistance without jeopardizing safety and security,” summarized Stevenson.